Harambee Black Arts Festival 50th Anniversary Celebration by Harambee Ujima Black Arts and Culture Association AUGUST 4TH, 5TH & 6TH, 2017! 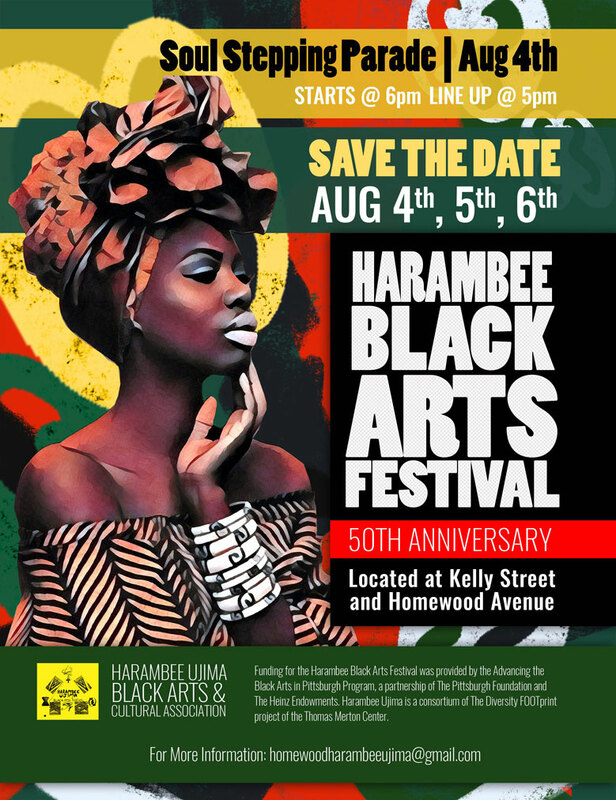 Celebrate the 50th anniversary of the Harambee Black Arts Festival in Homewood all weekend in August! The festival kicks off Friday, August 4th with the annual Soul Stepping Parade at 6 p.m. On the day of the parade and all day on Saturday, August 5th and Sunday, August 6th, you'll find the streets of Homewood packed with a variety of food and retail vendors, live music and dance performances, and information tables. Family friendly activities will be provided in the Children's Village and a display of local art will be showcased in the mobile Legacy Art Gallery. The event is free and open to the public, but we ask that you please RSVP and take part in our community survey. Want to play a bigger part in the 50th anniversary? The Harambee Black Arts Festival is currently seeking dedicated volunteers to help with set up, clean up, and various activities during the event. For more information, please contact us at homewoodharambeeujima@gmail.com. Funding for the Harambee Black Arts Festival was provided by the Advancing the Black Arts in Pittsburgh Program, a partnership of The Pittsburgh Foundation and The Heinz Endowments.